Today's art challenge was to 'use Dyan's Shadow Stamping technique on your page today'. I just love Dyan's shadow stamping technique and it's so easy to do. I sprayed lemon, orange and chocolate inks onto manila card in exactly the way Dyan describes in the video. Then I inked the stamp and followed her instructions again. I highlighted the leaves with a white pen. I randomly stamped with the alphabet stamp and then stamped the quote, the dragonflies and added the verse. And then I journaled around the quote. I cannot believe that we have come to the end of the 30 days of prompts. I hope that you have enjoyed our time together both here and on the Challenge Blog. Come back tomorrow to find out how I have put all the pages together into a journal. Don't throw anything away until you have seen tomorrow's post!!! Here on this blog I am going to share how I made the page for today's prompt on Appreciation. Today's art challenge was to 'use a paper serviette as part of your page today'. Today's page started with acrylic paint already on it from where I had mopped up paint from another page. I really love these sunflower serviettes and use them quite often in my journals. I tore off one corner of the serviette around the edge of the flower. I carefully pulled the top layer of the serviette from the other 2 layers. I brushed gel medium over the corner of the page and smoothed the serviette onto it. I brushed a coat of gel medium thinly over the tissue to ensure it didn't get damaged by anything I did later. I stamped more sunflowers at the top pf the page using the same technique as on November 21st. I trimmed off the excess serviette and sprayed lemon ink and orange across the top left of the page. And journaled across the page following the contour of where the ink met the serviette. I love this page because it actually ended up how I had seen it in my head. That doesn't happen very often. So satisfying. I hope you have a satisfying day too. See you tomorrow for our very last page. Here on this blog I am going to share how I made the page for today's prompt on Seasons. Today's art challenge was to 'use various household objects to print with on your page today'. Using several colours of acrylic paint I randomly smeared the paint over the page. I gathered together some household items ~ jar of Vaseline, toothbrushes, cookie cutters and some wire wool. I have to admit to buying the cookie cutters purely for art purposes. I wouldn't like anyone to be under the impression I cook!!! I put some acrylic paint on my plate and then stamped with the hearts down the right side. I used the bottom of the tub of vaseline on the left and the circles at the bottom are from twisting the wire wool on the page. I stamped again using a lighter colour of acrylic. I randomly stamped with two different stamps and Archival Ink. Then I sprayed over the page with orange ink and pink ink and let it move about the page before blotting it with my rag. I stamped the lines for the journaling and wrote between them. I stamped a border round the edges of the page ~ but you could doodle this with pen. And finally stuck on the verse. I really like this page. I was concerned at one point because when I had used the household objects to stamp with they just looked unconnected on the page. However when I sprayed ink over the top the page somehow came together. I love serendipitous things like that. Have fun with your page today. Here on this blog I am going to share how I made the page for today's prompt on Travel. Today's art challenge was to 'use an art medium you rarely use'. When I bought the Pan Pastels I used them quite often but I haven't used them for quite a while so I thought they fitted today's challenge. I started by using Pan Pastels through an arrow template. At which point I forgot to take a photograph. I tried to 'fix' it with hairspray. This is my usual method of making sure the pan pastel or chalks, if I'm using them, stick to the page. However the hairspray decided not to spray finely but to glug all over the page so it was quite wet. It seems to have survived. Then I stamped over the whole page with a 'crackle' stamp which I think looks a bit like a map. I sponged Peacock Feathers Distress Ink over the whole page. Then stamped the lamps, the quote, the compass and 'enjoy the journey'. I also inked the the verse and stuck it on. Finally I added the journaling. I'm looking forward to seeing what you use today. See you tomorrow. Here on this blog I am going to share how I made the page for today's prompt on Dreams. Today's art challenge was to 'make your own washi tape to use on your page today'. I thought I would try making my version of washi tape using surgical tape. I stuck some down on my glass plate and stamped on it. I sprayed some in on it but it seeped underneath and I was concerned it might stop it being sticky so I used Distress Ink instead. Then I went a bit berserk with a star stencil and the Fall Seasonal Distress Inks. And then I added some glimmer mist!!! One of the joys of having the glass plate was that I could put the tape over the top of the page to see if it would work! Which is when I decided it didn't and added some acrylic paint to it using my fingers. I added it to the page but wasn't particularly impressed with it. So I made some more tape using just Archival Ink. I put the new tape over the old tape. Sprayed the cut up verse and stuck it on. I highlighted some of the stars, doodled along the sides of the tape and journaled between the cut up verse. I think it's still too busy a background for me and would probably have started again except I'd already done the other side of the page. I suppose I could have covered it with gesso or sprayed more ink over it. Still there it is. A very starry page. I hope you have a better day. See you tomorrow. Here on this blog I am going to share how I made the page for today's prompt on Creation. Today's art challenge was to 'use Kaz Hall's Glue Stick Resist technique on your page today'. Kaz shows this technique on a tag. I thought I would experiment a little and wasn't at all sure it would work. First of all I sprayed water over the whole page. Then I sprayed 3 colours of inks. I sprayed some more water on and moved the paper so the inks would blend. (Photographed whilst wet). I blotted the wet paper onto the background paper and got some interesting added colours! I used the glue stick on a sunburst stamp and stamped around the edges. Then I inked over the whole page with Faded Jeans Distress Ink. This is the point where I didn't know whether it would work. I thought maybe as I wiped off the glue residue with a wet wipe it would wipe off the water-based inks but joy of joys, it didn't! In this photo you can see on the right where I've removed the glue. The glue is still present on the left. At the bottom of the page I sprayed yellow ink through a sunburst stencil. I sprayed the cut up Bible verse with yellow ink before sticking it on the page. I stamped the sunflowers and then highlighted the petal tips with white pen before outlining the verse and writing my journaling. I love how this turned out. Thanks Kaz for the technique. Here on this blog I am going to share how I made the page for today's prompt on Photography. Today's art challenge was to 'use the gesso transfer technique to add a photo to your page'. I decided to use a photo to make the whole background and because it was wet and miserable I printed off an inkjet copy of the photo and didn't go out to get a laser photocopy of it. I also printed a mirror image version to see which I would use. I tore round the edge of the printout and scraped gesso onto the whole page. I stuck the printout on, print side down and smoothed it on. Some of it wrinkled and some of it didn't really stick properly. When it was totally dry, I sprayed water onto the paper and rubbed it away with my fingers. As I said, not all of it was stuck properly, plus I think I wet some of it too much so bits of the image came away. I decided I would stick with though so you can see what happens when mistakes happen - they are called opportunities. I sprayed the whole page with Lime ink and stamped with Archival Ink. At this point I didn't like the page too much. I hadn't realised that the ink would make the page so dark. So I put some orange acrylic paint on part of the page with my fingers. I sprayed the verse with orange ink before sticking it on the page. I journaled and added highlights with a white pen. It's still not wonderful but I can come back to it later to play around with it. If you use an inkjet printout I think you probably need to leave it to dry for longer than the 5 minutes I left it. And actually using a laser photocopy does get better results. I have used a photocopy before and the image transfer was great. Anyway, a day for you to experiment. Have fun. See you tomorrow. My post for today published out of sync so please could you click on this link to see today's page. 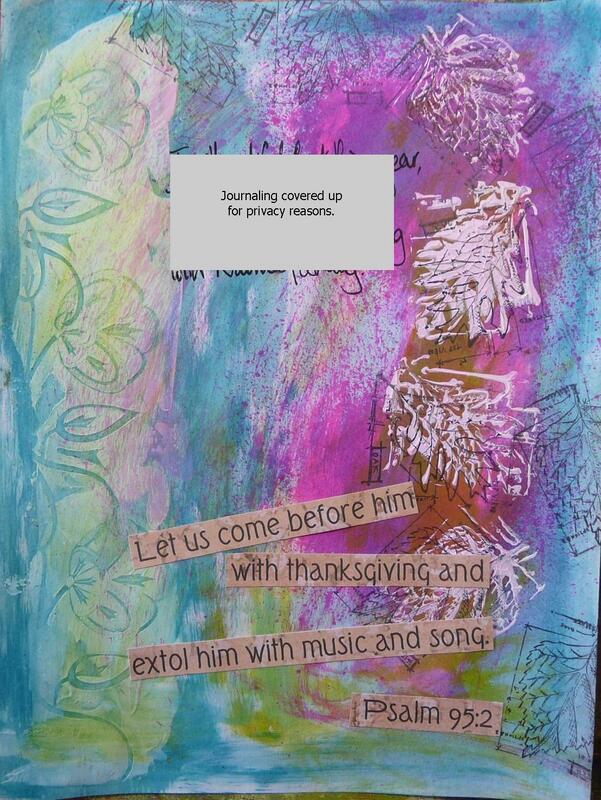 Here on this blog I am going to share how I made the page for today's prompt on Thanksgiving. Today's art challenge was to 'find a way to add texture to your page today'. I spread a narrow strip of gesso down the left hand side of the page and pressed a rubber stamp into the gesso and left the gesso to dry. Remember to clean your stamp straightaway. I wiped some turquoise and some green acrylic paint onto the whole page. Then I stamped the leaves with gesso instead of ink. When the gesso had dried I sprayed with pink ink and restamped the leaf stamps with black Archival ink. I also stamped some leaves off the edge of the page. I stuck the verse on and did the journaling. As the gesso dried it absorbed some of the bright pink ink so now the leaves are slightly pink! Another page to come back to I think. I might possibly highlight the flower pattern on the left hand side with black pen. Not sure though! What do you think? Today's art challenge was to 'use wrapping paper on your page today'. I sprayed the inks onto my paper and then to get rid of the excess paint I put it ink side down on my backing paper and interesting things happened. It picked up the turquoise stamping I had done when I was cleaning the stamp from the faux stitching. And picked up some of the other colours! I stamped some balloons at the top of the page. This is a tip from Dyan Reaveley. I stamped two of the images on plain paper and cut them out and covered two of the sets of balloons. I stamped over the top. I did this several times and all the ones I stamped after the initial four sets look as thought they are behind the first ones. Clever or what!?! Thank you Dyan. I added my verse and my journaling. Where the rectangular highlights are on the balloons I coloured in with a yellow glaze pen. I did this three times. You have to wait for it to dry between each application. Then I realised I'd forgotten the wrapping paper. I could only find birthday paper even though I'd written about Christmas. But never mind! I punched out some circles and stuck them on. I think I will need to come back and find some way to integrate the circles a little more. They look like I forgot the challenge and just stuck something on randomly. Which of course is what I did!!! !